LSU quarterback Justin McMillan drops back to pass during the spring game at Tiger Stadium on April 21. The most veteran quarterback on LSU’s roster, junior Justin McMillan from Cedar Hill, Texas, plays the role of the middle man among LSU’s three returning quarterbacks: While Myles Brennan might’ve been LSU’s best passer during spring practice and Lowell Narcisse was the Tigers’ most mobile quarterback, McMillan was in between, blending both sets of skills with his poise and knowledge. McMillan got more work than any other quarterback in the April 21 spring game, completing 14 of 29 passes for 216 yards and a touchdown, seemingly putting himself back in the thick of the competition. 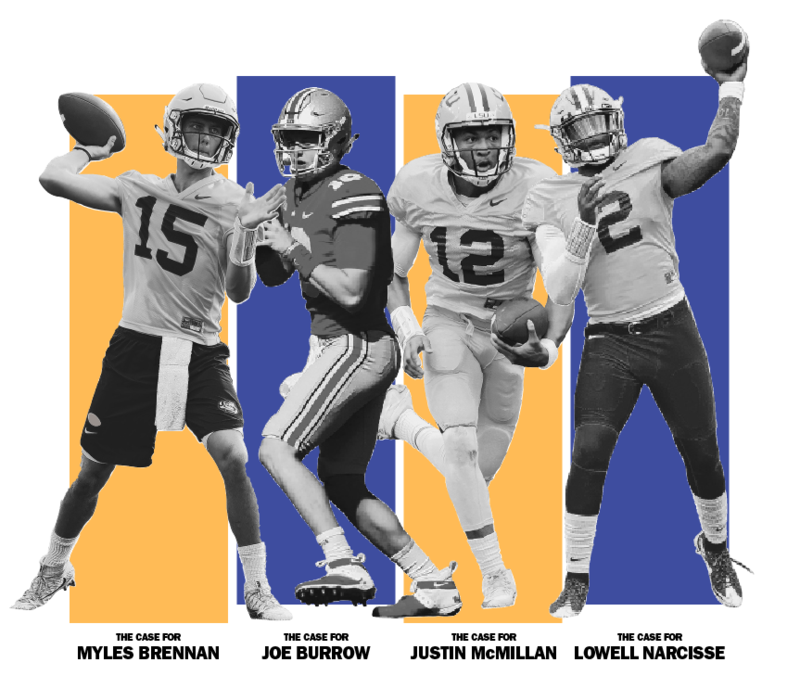 The arrival of Joe Burrow would seem to complicate McMillan’s standing, but his status as a dual-threat quarterback (and as a respected teammate) give him a glimmer of hope to win the starting job. This was on display in LSU’s spring game, when McMillan proved to be the least mistake-prone quarterback among himself, Brennan and Narcisse. In some ways, if LSU were to choose McMillan to start, he could end up like Danny Etling last season. The Tigers would have a trustworthy leader, one who likely won’t make many mistakes but also has limitations. For a young offense that has to replace all of its starters in the backfield and at wide receiver, McMillan could be a steadying presence for an otherwise inexperienced unit. But LSU is in search of playmakers and looking to transition to more of a pass-to-set-up-the-run scheme. McMillan will have to grow as a passer, improve his arm strength a little and flat-out beat the other quarterbacks to rightfully earn the starting job.